Haiku by myself. Photo is by Adam Pretty, and is a scene from International Junior Oympic Game held in Singapore. The water rings remind me of the Olympic mark. 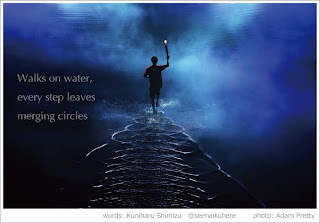 this haiga make me think about the cercles..., the water, and the humans..., it's a little difficult to explain..., anyway, thanks for share with.. I think I see what you are trying to say. In any case, to use the water rings effect is a great idea. I salute to those who planed this ceremony.